This week Martin Luther speaks to us from days gone by. 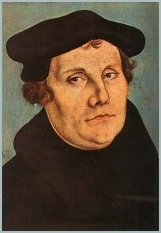 In terms of the Reformation, Luther is often seen as the father of it all, though some might point to Hus or others. God always had a remnant and the scarlet thread was never utterly effaced. For myself, I am not a Lutheran. If I had been raised in that tradition it might be different - who can tell? But I came up through a tradition of apathetic unbelief, rationalism and modernism. When I look back to Luther, I see a man of great moment and courage - and also a man, like all of us, with feet of clay. He was a product of his times, taken by the Holy Spirit and molded for use in the reclamation of the gospel from the apostasy, heresies and abuses of the medieval Roman Catholic quagmire. Was it commendable that he never left the Roman Church (he was excommunicated in 1521) or was his wanting to reform from within an admirable quality? God knows, for He alone is the judge of us all. And just exactly what did Luther believe about the atonement? Did he believe Christ died in a penal substitutionary way for every human being and that He then gives faith only to the elect, as modern Lutheranism seems to say? I can't subscribe to that understanding, but I have the benefit of the later Reformers and a retrospective of 500 years of ecclesiastical and theological history. Sermon of the WeekDid Jesus Preach Paul's Gospel?